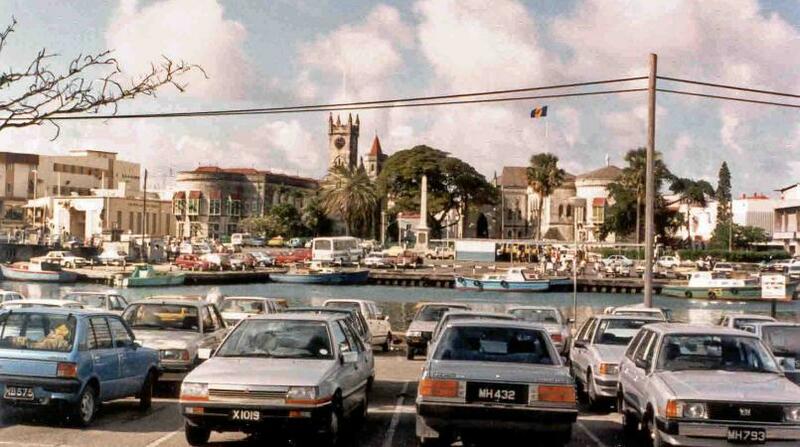 We’re not throwing back to Bridgetown when there were donkey carts, horse-drawn carriages and a Pelican Island. We’re not even going back to movies at the EMPIRE and rollerskating at Studio10. This is a mild throwback to changes in Bridgetown over the past 25 years. 2. Cross Bridge Street and look to the right, remember when that whole mall was just one big Julie’N supermarket? 3. Talking about supermarkets, Jordan’s is no Rick’s. Rick’s was as popular as a cream soda Baby Bim and cherished by all classes. 4. But if you needed a set of glasses or hard plastic cups, or a hot plate or a kerosene lamp, whatever the house need, the place for you was at the corner of Swan Street where a traffic light is now. All you had to do was walk in Barbados Hardware. You were sure to come out with your item wrapped in brown paper and a smile on your face. 5. Walking to "Lower Green" bus stand was easy too, it was short there in the now Jubilee Gardens. That bus terminal saved people some walk and the public restrooms saved others from moments of shame while helping to keep Bridgetown smelling sweet. 6. The Swing Bridge was functional just not hydraulic. 7. Swan Street was not cobbled and pretty. 8. There were more fabric stores in town. Remember Moses? 9. Red or blue, those were the two colours that Bata slippers came in and almost every child had a pair. But be careful how you walk or run in those rubber slippers because you just may need a pin to put underneath and stop them from ‘popping out’. Remember Bata? 10. Saturday morning you could find children from all schools in one place in Town…the Carnegie Library. Young toddlers and infants listened to readings and drama, primary-school-aged kids had a blast outside and up the stairs, while the secondary school students suffered in silence upstairs in Reference. Librarians on many occasions were babysitters while parents roamed town hassle-free. What other changes stand out for you?